It may be too early in MLS to deem any match “big,” but Saturday’s conference final rematch is about as good as it gets for early-May. Barely five months removed from a thrilling Conference Final, the Revolution and Red Bulls will renew their rivalry on Saturday at Gillette Stadium. Yes, the same venue where the Revolution lifted the Conference trophy and, not to be overlooked, Thierry Henry ultimately bid MLS adieu. Plenty has changed for the Red Bulls since. Not long after the postseason, Henry retired, the front office was revamped, Mike Petke was fired, Tim Cahill went to China. Even Saer Sene couldn’t escape the changes. But the Red Bulls haven’t missed a beat in 2015. With Jesse Marsch at the helm, Sacha Kljestan and Felipe Martins in tow, and oh yeah, Bradley Wright-Phillips still in the fold, the Jersey-based outfit is in strong form and undefeated at the moment. Then, of course, is the Revolution. A slow start gave way to an impressive run that has given them a share of first place. Seven different goalscorers, a remarkably strong defense and a dynamic attack have shown the rest of the league that last year’s late-season run was no fluke. Yes, there’s no Henry, Cahill or Petke (or Sene) this time around. But given the current trajectories, those details shouldn’t damper things one bit. Before Revolution-Red Bulls does its part to add to the intrigue of a Saturday that has Mayweather-Pacquiao, the Kentucky Derby and Red Sox-Yankees all on the agenda, let’s take a look at the questions surrounding the locals. 1. What will the front three look like? Jay Heaps wasted no time throwing cold water on the idea of a preferred front three following last weekend’s rout of Real Salt Lake. Teal Bunbury, Charlie Davies and Juan Agudelo all played vital roles in the four-goal outing, but to Heaps, it’s all about – you guessed it – the match up. With the Red Bulls in town, and Lloyd Sam a constant threat, Heaps will need to fight speed with speed. Translation: Kevin Alston at left back. If that’s the case, then Chris Tierney be pushed up into the midfield, similar to what we saw the last time New York came to town. Agudelo and Davies will probably reprise their roles, while Bunbury could be headed back to the bench. 2. Which Revolution player will need to step up? The Red Bulls average 15.7 total shots and 5.6 shots on goal per game, both tops in MLS. They hold the ball well (57.1 percent possession), and are good in the air as well (25.7 aerial duels won/game). Oh, and did we mentioned they still have the league’s reigning Golden Boot winner? It’s fair to say it’ll take a team-wide effort on the part of the Revolution to match wits with the last undefeated squad in the league. But if you combine all of these facts, multiply it by two and square it, the ultimate answer is Bobby Shuttleworth who’ll need to rise to the occasion on Saturday. 3. 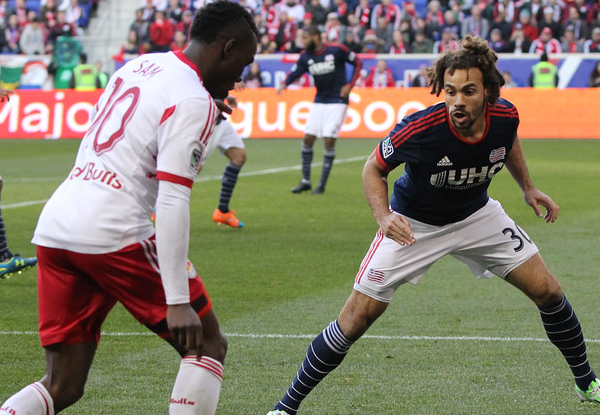 Will we see Lee Nguyen? His name may not have shown up on the injury report, but there is some doubt about whether Nguyen will actually play on Saturday. Last year’s Revolution scoring king missed training earlier in the week, and was not made available to the media on Tuesday or Wednesday. The combination of the two often suggests an injury, even if he wasn’t listed on this week’s list of walking wounded. But don’t forget: prior to their match at Colorado, Chris Tierney missed training, and didn’t show up on the injury report. On gameday, we learned that he was hurt, and wasn’t available for selection. So you just never know. One thing we do know: if Nguyen is healthy, he’ll play. 4. What will the back line look like? The possible return of Alston to the back line may not be the only change we see. Jose Goncalves is off the injury list and presumably ready to go, but his return may not be a given. Andrew Farrell has partnered well with Jermaine Jones, who’s certainly held his own in the rear. Heaps might be all about creating consistency in the heart of the defense, but don’t think for a minute that he overlooks the hot hand, and what’s working. Farrell and Jones have meshed well over the last two games, no doubt, and with the potent Red Bulls in town, it may not be an ideal time to change it back. Meanwhile, one person who isn’t worried about it all: London Woodberry. 5. Are the Red Bulls beatable? Henry and Cahill have since moved on, but the Red Bulls sure aren’t lacking for offense. Wright-Phillips remains dangerous, as does Sam and unlikely hero Mike Grella. By and large, the additions of Kljestan and Felipe have made the Red Bulls as more cohesive unit. In many respects, the Red Bulls are harder to shut down because they’re no longer temped to lean on one or two star players. But two things favor the Revolution’s cause on Saturday: 1. the Red Bulls recent schedule (Saturday’s match will be their third game in eight days), and 2. the Red Bulls aren’t all that successful at Gillette Stadium over the years. On Friday, much was made of the Red Bulls’ concerns about the stadium’s “worse” turf. Possession and chances are great. So is putting a ton of shots on target. But converting possession and attacking chances is another thing entirely at a place that has historically been unkind to the MetroStars/Red Bulls. What other questions surround the Revolution going into Saturday’s match? Let us know in the comments section.